Over the past 20 years, the standard for kitchen counter designs has shifted from laminate to stone, most commonly granite – but in some cases, natural or man-made quartz and in some very rare cases, soapstone and marble as well. So, what are the advantages and disadvantages? Let’s break them down. Granite is the most common kitchen counter material due to its relatively inexpensive cost and ready availability. It is more resistant to staining and has a wide variety of colours, some of which don’t look like your typical salt and pepper granite. 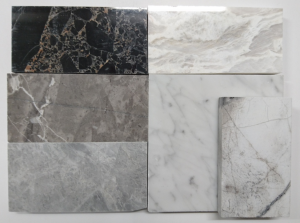 Gone are the days of granite only looking like bits of quartz, feldspar and mica – some granite looks a lot more like marble and we’re even seeing some approaching pure white. Here is a range of unusual granites that we keep in our library. Manmade quartz typically has one consistent colour, with flecks of quartz in it to make it shiny or sparkly. 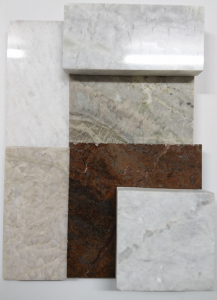 Over the past 10 years, this product has evolved to take on the appearance of more interesting natural stones and can provide some options which are not available in natural stone as well. While some manmade quartz is relatively inexpensive, some of the quartz products do approach the middle price range and even higher. On average a manmade quartz is going to be about the same as a granite, price wise. 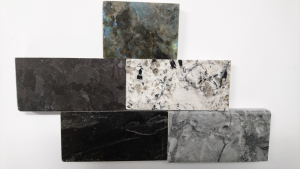 The benefits for kitchen designs are a much wider range of colours and textures compared to granite, however – these are still crushed quartz filled with a resin, and despite what others may say, we have found them to stain. Cleaning is possible. So as long as we discuss the pros and cons and everyone is aware of the potential issues, we do specify manmade quartz as it gives us a lot more latitude design wise. Especially in the whites and lighter colours. It is a good alternative for kitchen counters when the palette demands a white counter. Natural quartz has a bit of grandeur associated with it, it looks very elegant – and has a very unique undertone. Generally quartz has a lot more visual depth to it. It is harder than granite, wears really well, does not absorb oils and does not stain (as a rule). It does, however, have disadvantages in cost and can sometimes be brittle. Quartz is usually the most expensive stone. It is dramatic and makes a statement. It is absolutely viable for a kitchen, but as noted some slabs can be brittle and as such – a slab of quartz should be inspected on a case by case basis before being selected for purchase. Marble is soft, being composed primarily of calcium. It also has the most variation in price, starting from low all the way up to very high end. We do not recommend using marble for a kitchen counter. Marble is a porous stone, and will absorb anything spilled on it even just for a couple of hours and can scratch from heavy items sliding over the surface. Marble will wear over time; it is never going to look the same as when it was installed, even after 6 months. Acids, such as lime juice, tomato sauce and wine can etch the surface causing white rings to appear. If you’re OK with your kitchen counter looking used, showing marks and cuts and altogether looking worn, then by all means – use marble. It is, after all, the counter of choice for French pastry chefs. My great grandmother’s baking table had a white marble top that the fats from the pastry dough had soaked into. It had a patina and translucency which made it unique. This look can be quite suitable for some houses and if you are aware of what it will do, then it is an option to consider. A. Don’t perform well in a kitchen (absorb too much staining). B. Wear too quickly over time. The exception is soapstone. This is a very specific material that has been used for kitchens with the understanding that, like marble, it wears very easily. We never suggest soapstone unless a client asks. It can be scratched with a finger tip. However it has properties and qualities that, like marble, make it an option worth considering. For a casual chef’s kitchen that ages gracefully, with care, the matte finish of a soapstone might be worth considering. 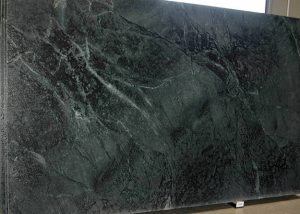 This is a photo of an entire slab of soapstone measuring about 4’ x 8’ wide. Remember a kitchen counter is only about half a slab wide, so when you look at the whole slab, imagine that it gets cut in half. Most stone showrooms will let you browse the slabs they have in stock, and walking through and finding the right piece of stone for a project is one of my favorite parts of the job. It is critical to select the stone seeing the whole slab, not a small sample, so we get to see the graining and patterning of the entire piece. Remember how it is going to be cut and where the patterns will be on the final kitchen counter. Run your hand over the slab to feel for cracks or fissures. Inspect it for fill (in the stone voids) and also look at the surface in the light so you can see if the polish is consistent. The right stone counter for any project is critical. It is a major part of the look and is the surface that takes the most wear. Finding the perfect choice for a counter requires some time and searching. We make this a priority. 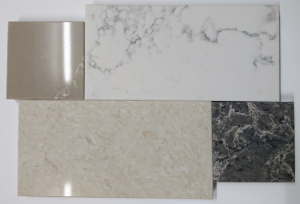 Contact us to help uncover the right material for your kitchen counter top.